Looks as if it's based around an oversize pair of handcuffs! File under not-road-legal vehicles that have wheels and are faster than walking. Well, exactly. You could buy a folding e-bike for that, which would have more uses. How many attempts have there been at all-electric drivetrains? Folding utility bikes might be one application where they just might make sense, especially if you can add a small battery for e-assist. The efficiency gets you if you rely on human power alone, but as you say, that's not such a problem if it's an e-assist bike anyway. It's something that would be interesting to play with, as you effectively get a software-defined CVT. And no exposed oily bits. I suspect the compelling argument against it is that you can make it even more mechanically simple by swapping the genset at the cranks for a simple sensor and adding a bit more battery capacity instead. How big are the losses likely to be - 10% overall? 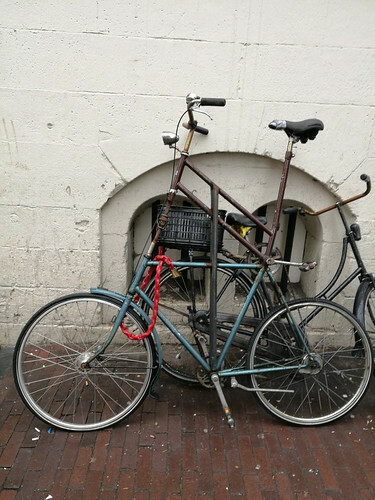 In which case it might still make sense (FCVO) for a utility bike in places with civilised infrastructure, especially if the lack of chain means you can design a cunning fold or what have you. Which makes me wonder in a rules-lawyery kind of way: is a vehicle with a 250W motor and cranks that aren't connected to anything but a pedal sensor, a road-legal bicycle? I test rode a Mando Footloose that tried this a few years ago. The basic problem is that spinning a generator that has no feel to it in relation to your riding is really unpleasant. It also had very little resistance to the pedals so you probably weren't contributing much power. AIUI the pedals have to be capable of 'propelling' the cycle, so probably not. One possiblity for a heavy cargobike that has to stop a lot is a hub motor for regen and a low single-speed for maximum human assistance on starts and steep climbs where the motor is least efficient. Once up to minimum speed the pedals freewheel an power a genartor, giving a constant regen of say 100 watts. Depends how you feel about Snoopy. Yay! Room for my bell, my tea, my light (high enough to see over the bar bag), my gps and my bag! Exactly what I need. "The goddess Kali depicted as a bicycle." Parked next to my bike at work the other day. Do bikes in shops count? 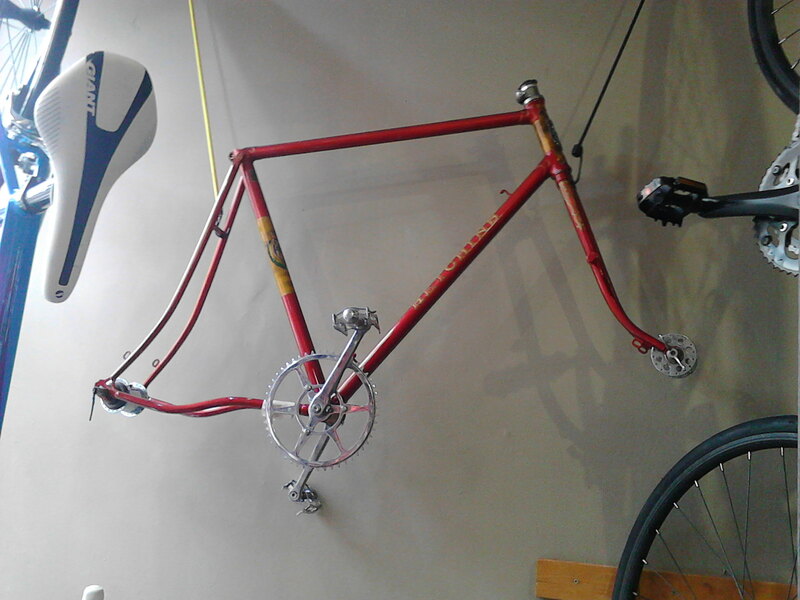 This was in Colston Bike Workshop. Pedaling effort sets up a wave motion in the chain, which in this case was in exact counter-frequency to the wave in the stays and therefore the entire chain dematerialised. The rims and spokes are invisible due to their extremely high speed, whereas hubs of course are essentially stationary. 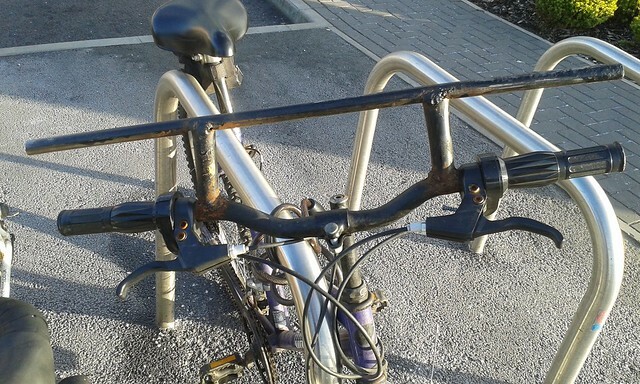 Noticed an interesting modification to an otherwise normal hybrid as its owner unlocked it outside the shop yesterday: A Mk 1 bit of knicker elastic linking the top of the lower front mudguard stays to one of the down-tube cable stops. 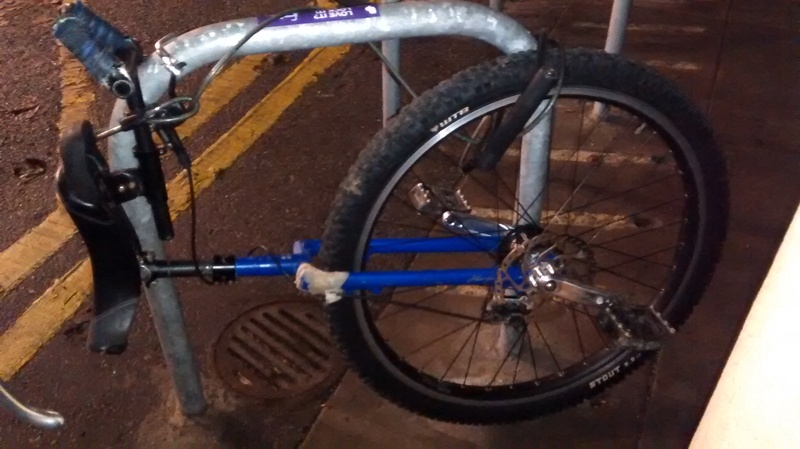 I couldn't work out whether this was an exasperated bodge to prevent the mudguard rubbing, or an attempt at a rudimentary steering damper. It didn't look like it was stunningly effective at either. Very poor show: they haven't synchronised top and bottom cranks.